Larson Electronics has announced the release of a powerful new LED light bar that provides impressive lighting performance combined with extreme durability. The LEDP5W-18R LED Light Bar produces over 8,000 lumens of light output and can withstand abusive conditions that would cause standard incandescent lights to fail. The LEDP5W-18R LED light bar from Larson Electronics is a compact yet very powerful LED light bar that produces over 8,000 lumens of high intensity output in a rugged design built to withstand the demands of extreme operating conditions. This round LED light bar measures only 6.73 inches wide by 7.18 inches high, yet packs a punch with 8,334 lumens of intense light output. Drawing only 90 watts and 7.5 amps from a 12 volt electrical system, it is also extremely efficient and ideal for mobile applications such as installation on vehicles or heavy equipment. The housing is formed from extruded aluminum for high durability and an unbreakable polycarbonate lens provides excellent resistance to scratching and damage from impacts. The LED assembly features 18 Cree LEDs for the utmost in performance and reliability, and built in electronics provide active heat and voltage management to provide maximum output as well as a long 50,000 hour operating life. The built in electronics utilize Pulse Width Modulationtechnology that automatically senses current and heat levels and maintains them at optimum levels for the highest performance possible. The entire unit is sealed against the intrusion of water, dust and dirt, and can withstand complete submersion up to 3 meters for extended periods. The mounting base is a rugged single stud design that provides added resistance to vibration and simple installation. This mounting base is adjustable and has built in damping features which help to isolate the lamp assembly from the effects of damaging vibrations and impacts. This light can be operated on any voltage ranging from 9 to 46 volts DC, making it ideal for vehicles, equipment, machinery, and just about anywhere a standard 12 or 24 volt electrical system is used. 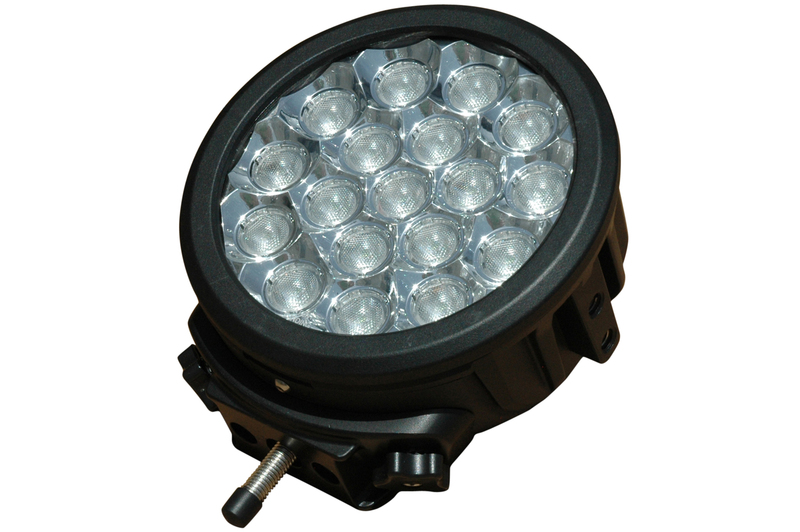 The high power and durability of thisLED light makes it especially well-suited to construction, marine, and industrial applications, and the low power requirements ensure less drain on the limited power supplied by 12 or 24 volt batteries.